LP -first edition- strictly limited edition auf heavy white Vinyl is limited to 500 copies. Info: A legend returns after 22 years with the first new album in the original cast back! When Marc Verhaeghens and Dirk Ivens more than 29 years ago, formed under the name "The Klinik," she reasoned with her evocative blend of cold, hard sequencer-dominated sounds, reduced arrangements, minimalist lyrics and growling vocal lines a completely new style in the electronic music. Dancefloor hits like "Memories", "Moving Hands" or "Black Leather" still belong to the standard repertoire of most underground clubs and the stripped-down industrial sound is still inspiration for many subsequent acts. Now appears with "Eat Your Heart Out" finally a new album of the pioneering Belgian formation on Out Of Line Music. With this release come full circle, but were The Klinik nearly two decades of significant impetus for the label creation and their song "Out Of Line" from the legendary "Face To Face" album's namesake. To "Eat Your Heart Out", the band has gathered together nine new pieces in the classic The Sound Clinic: cold, menacing, barren and sometimes quite scary it echoes from the speakers. The hard sequencer and tribal rhythms are the emotional frontier experience and Dirk Ivens lends to the music that has become a reasonably extensive trauma to the bone voice. 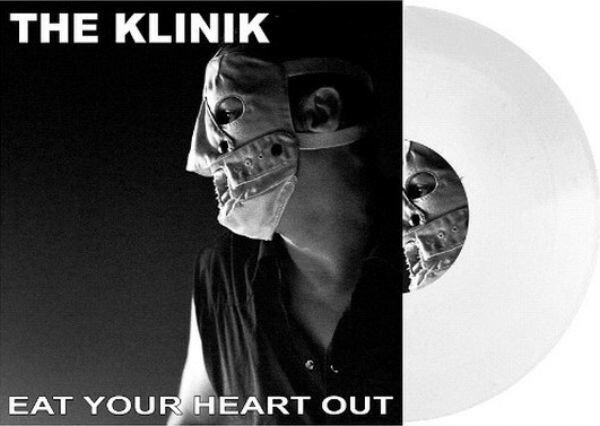 Everything in "Eat Your Heart Out" is 100% The Klinik ... so when the band was never gone. Especially falls on how contemporary, innovative and modern minimalist sound powers of this group still sound today: an album like a feverish nightmare and an impressive, new signs of life one of the greatest innovators of the underground electronics. Nobody does it like The Klinik! Status. Only 4. copies available ! Customer evaluation for "THE KLINIK - Eat Your Heart Out LP (1st Lim500)"